If you are navigating the process of adjusting to life with a prosthetic device or helping a child to begin this new challenge, we are here to help. 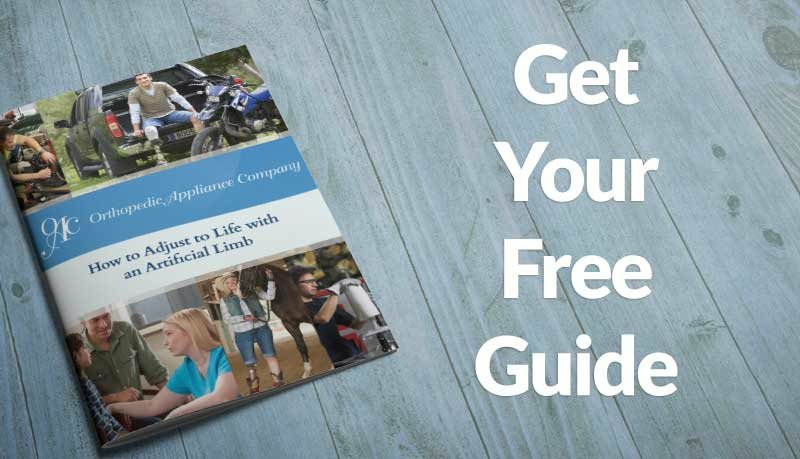 To kickstart your research, we have written a short book, How to Adjust to Life with an Artificial Limb – a seven-step guide to adjusting to life with an artificial limb. In this post, we will introduce the guide. Once you have established your support network, you will be on your way to creating your new normal. Your doctors, pediatricians, counselors, and other key experts will help you create your plan for recovery. You or your child will need to be recommended prosthetic devices that conform to your unique situations. Orthopedic Appliance Company will work with doctors to evaluate your needs, design, and develop an artificial limb that is uniquely yours. The right prosthetic device is vital for establishing your new normal. For children especially, a device will require routine reevaluation to keep pace with changes. A significant but challenging step in returning to normalcy after an amputation is returning to work or school. You can help prepare your child for the classroom, cafeteria, and playground by having conversations with your child’s teachers and school administrators, conveying the recommendations of your child’s doctors and counselors. You cannot control how other people may react, nor account for all of the challenges of classroom or workplace, but with the right support system in place, you can make sure you or your child are as prepared as possible. Furthermore, finding a peer support group will help connect you with people who have been where you have been, heard what you have heard, and navigated the process well. You can read more about how to adjust to life with an artificial limb in our book, available for free by following this link. For additional resources, information about prosthesis, and help finding the right artificial limb contact us. Orthopedic Appliance Company has been providing the Asheville area with high-quality prosthetic devices since 1960.